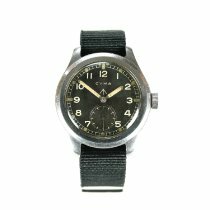 The WWW’s are perhaps the most popular and collectible military watches amongst all those issued to the British Army. This is perhaps because they were the first to be specially designed and custom made for the British Army. WWW stands for Watch, Wrist, Waterproof and was the descriptive code used by the British Army to identify it as a piece of equipment. 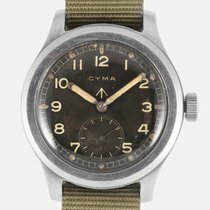 These watches began being manufactured and issued to the British Army in early 1945. There were 12 Swiss manufacturers of the WWW’s and as such, the collection is commonly referred to by collectors and dealers alike as “The Dirty Dozen”. Only around 5,000 Longines WWW watches were made for the British Army during WW2. 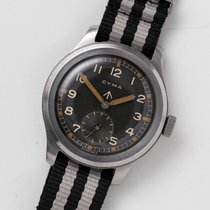 As such, good original examples of these watches are very sought after by collectors and can often be difficult to find. The Longines WWW is in excellent original condition and is one of the very best examples you could ever hope to find. The original factory dial is in excellent condition with no obvious flaws or blemishes. The cathedral hands, seconds hand and crown are all correct to the original specification of the watch. As expected, there are a number of fairly minor scratches and marks to the outer casing of the watch which are commensurate with age. A very small section of the inner case edge adjacent to the “1” marker appears to have been cut away. Importantly, the numbers on the case back match those on the lug which is becoming increasingly rare to find. The 12.68z calibre movement is in excellent condition and is currently running well and keeping excellent time. All our terms and conditions of sale can be found on our website, Finest Hour Vintage Military Timepieces & Collectibles.